There were over one hundred sentenced republican prisoners in Crumlin Road at the time of Williams’ execution and several hundred internees. They fasted on the day of Williams’ execution. Mass was to be said at 8 am and the chaplain had arranged to time a key point in the service, when he was to raise the communion host, would coincide with the exact time of Williams execution. The resonance of the symbolism of sacrifice in Catholic theology was easily understood and it broke up many of those present. One of those present, Jimmy Steele, later published a poem called ‘The Soldier’ which was dedicated to Williams. Another sentenced prisoner who was in A wing the morning of the execution, Arthur Corr, wrote a song called ‘Tom Williams’ (early versions of it in print appear anonymously). Corr wrote it in his cell in A wing after Williams’ execution. It was published in the Belfast IRA newspaper, Resurgent Ulster, in 1954. It has been subsequently recorded by various people without assigning credit to Corr. I’ve linked a version recorded here by the great Eamon Largey who knew both Steele and Corr and would have learned it from them (it is also uncredited on the Flying Column album ‘Folk Time in Ireland‘). I have also reprinted it in full below. Corr undoubtedly wrote other songs for also which he appears not to have received any credit. In that sense, the sentiment of the opening lines “Time must pass as years roll by, But in memory I shall keep, Of a night in Belfast Prison, Unshamefully I saw men weep…” is very much real. The extent to which songs and ballads communicated political messages is probably worthy of more attention. A striking emotional theme and a catchy melody was surely the most effective of propaganda tools and, as we all know, once a tune is stuck inside your head, it’s hard to get it out of there. "The impression is effectively created by English policy, military and political that the Northern problem is based on sectarianism. Republicans realise that there is a sectarian problem created and fostered by England but that reconciliation and an end to sectarianism depends upon English withdrawal…" This is a quote from an article published in Republican News on 21st June 1975. This followed the publication of claims in The Sunday Times that loyalists were being directed onto targets by the security forces. Of note here, as the article flags, is that this included friends and relatives of suspected members of the IRA, not just suspects. What is not noted (although it may just be implicit) is the extent to which this reflects the broader methods of security policy and sectarianism in Ireland. Of course, The Sunday Times disclosure did not lead to arrests or convictions arising from the supply of security force intelligence data to loyalists. This was yet another public demonstration of the capacity of the state to refuse to abide by its own laws. The extreme end of that spectrum may be immunity for murder, license to kill with no fear of investigation or threat of prosecution, sham legal processes such as inquests and inquiries and collusion. But the same thread, acting outside the law without fear of prosecution or being forced to observe the same legal limits and standards as everyone else applies to continuing activities such as bonfires and (up to recently) loyal Order parades. Nor are the issues of collusion or security force immunity resolved today (by continually refusing to deal with the issue, a succession of governments have effectively re-endorsed it as policy). These are not actions hidden behind closed doors. Instead these are very public acts to demonstrate an ability by a section of the population to subvert the supposed laws applied by the state, pretty much the definition of sectarianism. Here is the full text of the article. Dossiers and files compiled by English intelligence units operating in Republican areas have been passed to loyalist paramilitary organisations by English soldiers. The disclosure made by The Sunday Times, who were given samples of some of the documents by a loyalist, verifies what Republicans have been saying for a long time, namely that the English Army is patronising loyalist sectarian assassins. The secret documents contain the names and addresses of hundreds of Republican internees, their home addresses, and the names and addresses of their families, relations and friends, as well as information on those who visit men in English concentration camps in the North. One document is, according to the Times report, part of a dossier of "suspected" members of the IRA, compiled at English Army headquarters in Lisburn. This contains photographs taken by the English Army during the interrogation and screening of Republicans and one such photographs is of Belfast Republican leader, Joe Cahill. Another document contains photographs and particulars about Provisional IRA supporters, mostly in the nationalist Ardoyne area of Belfast, giving such details as the place where the "suspect" works and his car registration number. The disclosure that the loyalist para-military organisations have possession of such information, not only gives added credence to the belief amongst Republicans that English troops in the North are working "hand in hand" with the loyalists, but such claims increase the fears in minority areas of further assassinations by loyalist gunmen. Such fear and anxiety in minority nationalist communities is something the English have always utilised to their advantage. The most sinister fact of the matter is that the documents include names and addresses of the friends and relatives of hundred of detainees – something is causing considerable anger amongst the people of minority areas. Undoubtedly, however, the situation would be more seriously disturbing for such people were it not for their total confidence in the leadership of the Provisional Republican Movement and its capacity to defend them. Loyalist paramilitary groups have claimed in the past that they have dossiers on known republican and their families. Republican have never had any doubt about the veracity of these claims, nor the origin of their information, distributed and handed down through units of the English Army throughout the North. Such claims are forwarded always in conjunction with the usual threats and at a time when the political question of the maintenance or withdrawal of English rule in the limelight. This is understandable since none knows better than does the loyalist himself that English rule is loyalist rule as far as the North is concerned and such rule is rooted in sectarian division. The impression is effectively created by English policy, military and political that the Northern problem is based on sectarianism. Republicans realise that there is a sectarian problem created and fostered by England but that reconciliation and an end to sectarianism depends upon English withdrawal. Only after an end to English rule will the METHODS of English rule disappear. Sectarianism is the last vestige of England&apos;s methods for maintain her power in Ireland. On the 8th March 1973, the British government held a referendum in the north in which it asked voters to indicate their preference between two statements: “Do you want Northern Ireland to remain part of the United Kingdom?” and “Do you want Northern Ireland to be joined with the the Republic of Ireland outside the United Kingdom?” To date it is the only formal referendum that has asked voters to choose between these specific options. The order for the vote, under the Northern Ireland (Border Poll) Act of 1972, was published on 24th January 1973. It included a provision for only a single counting centre so that results could not be analysed at a constituency level. The number of polling booths to be used for the election was reduced from 900 to around 380. Specific provision was made for postal voting that meant that anyone who was on the 1973 electoral register (for Stormont) was eligible to get a postal vote from an address in the UK only (essentially meaning that anyone who had fled over the border could not use an address in the south). The poll, which had been vaguely promised when Stormont was prorogued and direct rule introduced (in March 1972), was almost immediately dismissed as a pointless exercise. Even British Labour party MPs had been critical of the reduction in polling stations and suppression of constituency level results. The announcement had followed a Green Paper from William Whitelaw on ‘The Future of Northern Ireland‘, which was to be followed by a White Paper (but not until after the poll). Membership of the EEC and its opportunities for cross-border co-operation were also part of the public debate at the time Whitelaw announced the Border Poll would take place. As the poll was announced, the Nationalist Party and Republican Labour confirmed that they would be calling for a boycott of the Border Poll. The SDLP followed suit in late January, also calling on voters to register for postal votes to ensure they weren’t impersonated at a polling station. The Northern Ireland Civil Rights Association had followed suit by 30th January criticising the simplified questions being asked in the poll. It also pointed out the position being taken by the Alliance Party in supporting the poll, questioning the wisdom of it falling into the same camp as the Unionists and Ulster Vanguard, although it expected Alliance to do “…much soul searching, leading ultimately to abstentions…” (see The Irish Times, 31st January 1973). Whatever soul searching Alliance did, it openly campaigned for the UK option in the poll. Political parties in the south were also dismissive of the poll. The IRA studiously ignored the Border Poll, with little mention in Republican News. Like the Alliance, the NI Labour Party openly supported the UK option in the Border Poll, but were taken aback in a meeting with the British Labour Party in mid-February when they were criticised by some for not supporting a united Ireland. In the week before polling, as the extent of the boycott became evident in the numbers of applications for postal votes, the debate shifted on to how a result should be interpreted. Given the lack of official status of any referendum result, the poll became largely an exercise in measuring the unionist vote. In the days before voting, the nationalist MP Frank McManus noted that when a similar poll had been held in Malta, the result was dismissed as the turnout was below 50% (see Irish Times, 6th March 1973). In the same days, Brian Faulkner and other unionists were indicating that they would be disappointed if less than 550,000, or under 50% of the total electorate did not vote for the UK option. John Taylor had suggested on television that they needed to get 100% of Protestants and 20% of Catholics to vote for the UK option to demonstrate support for the union (that would be roughly 725,000 votes). Given the electorate of 1,030,000, that 550,000 target wasn’t overly ambitious. The parties campaigning for votes for the UK option, the likes of the Unionist Party, Ulster Vanguard, NI Labour had got around 567,500 votes in the 1970 elections to Westminster (when there was 5,000 less on the electoral register). Alliance, which hadn’t contested the election in 1970, were to receive between 66,000 and 98,000 votes in two further elections in 1973 (in both cases overall turnout was lower than it had been in 1970). The paradox for unionists lay in the quasi-democratic nature of the UK where a referendum had not actual standing, and, that the number of actual voters could now be conflated with support for the union, meaning even a sizeable win for the UK option, if below 50% of the electorate, could actually be represented as rejection of the union. 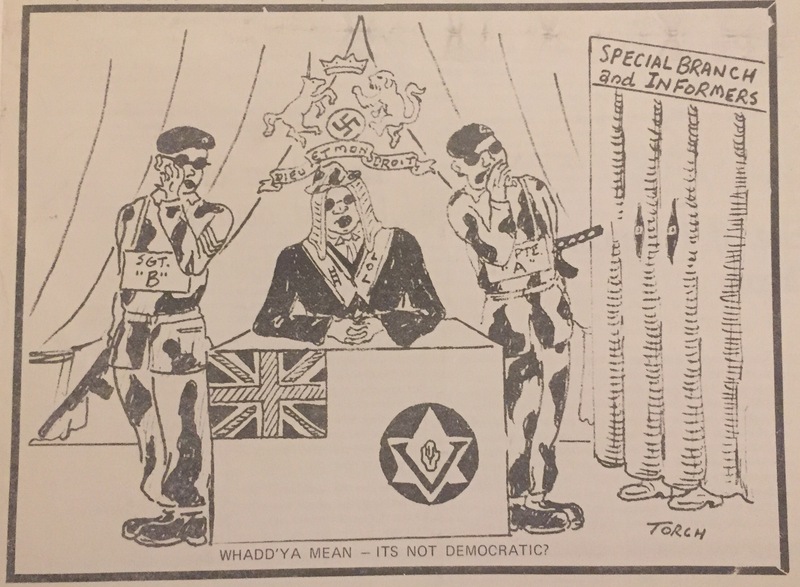 Republican News cartoon, 3rd March 1973. Just as counting of ballots was undertaken at one centre only, there wasn’t even official reporting of turnout in each constituency. So only some anecdotal references give hints of the turnout. The day after the vote, The Irish Times suggested that it was believed that 1% of Catholics had voted in Derry and reported that unionists believed that overall turnout among Protestants was at 90%. Given that many people questioned the activity of unionist observers inside the polling stations (in some cases it was claimed they even were openly ‘assisting’ election staff), that figure may reflect detailed knowledge of who was marked as having voted on the electoral registers. The Strabane Chronicle of 17th March 1973 reported that; “In Omagh, several hundred Unionist voters went to the polling booth for the predominantly Catholic West ward, or about one-fifth of those entitled to vote on that day. About 40% of the population had postal votes. There was a very large turnout however at the booths for the other two wards in the town, the mainly Protestant South and North wards. In several areas, namely in the Carrickmore and Aghyaran areas and at some booths in the Strabane district, the turn-out of voters, was in single figures.” The high proportion of postal votes was reflected elsewhere, such as Fermanagh, where a huge number had reportedly applied for postal votes. In both cases, this was presumably to prevent impersonation. The formal result was that 591,820 voted for the UK option, while 6,463 voted for the United Ireland option. Politically, the number of voters who came out for the unionists later in 1973 didn’t exceed 450,000. The likes of Alliance and NI Labour combined in the later elections in 1973 got between 66,000 and 98,000 votes. The success metrics suggested by likes of Faulkener before the poll appear to have been met only by Alliance and NI Labour supporters bolstering the mainstream unionist vote. The result didn’t come near John Taylor’s suggestion of 725,000 votes. Bob Cooper (Alliance) claimed the result justified Alliance’s stand, and insisted that substantial number of Catholics had come out and voted for the UK option. In the 1971 census figures, though, the 591,820 would equate to about 91% of the non-Catholic population. While it is obviously too simplistic to insist that voting and the boycott were observed solely along religious lines, it does make Cooper’s justification appear implausibly weak. Ironically, the main outcome of Alliance and NI Labour support for the UK option in the Border Poll was in providing sufficient additional votes to allow Faulkner and the unionists to claim a victory of sorts. In the days leading up to the execution of Tom Williams in 1942, the IRA released a ‘Special Manifesto‘ as a printed circular on Sunday 30th August, largely written by John Graham and Hugh McAteer. This was the day following a reprieve for five of Williams’ co-accused. This ‘Special Manifesto‘ is often presented as a proclamation and treated as the beginning of a ‘northern campaign’ (eg see Bowyer-Bell’s Secret Army). But the actual text, reproduced in full below, doesn’t support that interpretation. True, arms had been moved in place. Indeed, a significant dump at Budore, near Hannahstown, was captured on the Monday after the ‘Special Manifesto’ was issued, leading to the death of IRA volunteer Gerry O’Callaghan. But the relocation of arms into dumps in the north was in anticipation of a campaign, not as a prelude (and as a much a reflection of the formal shift of the IRA’s centre to Belfast from that July). The September issue of Republican News, published almost two weeks later on 11th September, specifically states that, following Williams’ execution, “…neither the passions of the people, nor the fiery demand for action of the Volunteers, will make the Army authorities enter into hasty or unplanned action.” In reality, there was no ‘northern campaign’. 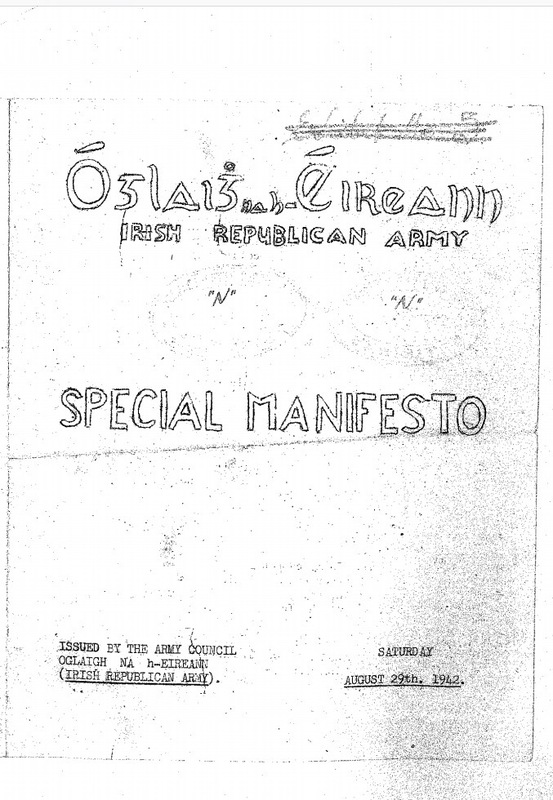 The manifesto even goes as far as making reference to the “…resumption of hostilities between Great Britain and the Irish Republic…” indicating a tacit acceptance that the military campaign against Britain that had been declared in January 1939 was effectively suspended (if not over, which was the reality by 1940). It is notable here that the formal cancellation of the 1939 campaign in March 1945, by a reconvened Army Council under Paddy Fleming, made no mention of a ‘northern campaign’. In effect, IRA operations that took place in September 1942 were a response to Williams’ execution, rather than a formal campaign (I will post more on this in the next few days). In the meantime, here is the text of the ‘Special Manifesto‘ below. It had been decided that the moment is opportune to restate the National principles actuating the Irish Republican Army, and to declare its attitude in relation to the present world situation in the light of those principles. The publication of this manifesto should not only remove misapprehension from the public mind, but provide an effective answer to the mischievous and mendacious propaganda constantly emanating from anti-Republican sources. (1) The Irish Republican Army is determined to obtain and maintain the right of the people of Ireland to the unfettered control of Irish destinies, guaranteeing civil and religious liberty, equal rights and equal opportunities to all its citizens. The maintenance of sectarian strife forms no part of the policy of the Irish Republican Army, which is conscious of the national pride permeating men of all creeds within its ranks. It believes that the Nation’s sovereignty extends not only to all the mend and women of the Nation, but to all its resources; all the wealth and all the wealth-producing processes of the Nation. (2) The Irish Republican Army cannot recognize the right of England or any other power to maintain forces in, or base them on, any part of the Irish territory without the free consent of the Irish people. (3) In view of the fact that the free consent of the Irish people has not been obtained for the present occupation of Northeast Ireland by British and allied forces, the Irish Republican Army reserves the right to use whatever measures present themselves to clear this territory of such forces. (4) While prepared to accept aid, as in the past, from their exiled brethren in America, or those nations which understand and recognize the right of the Irish people to full control of their own destiny, the Irish Republican Army, being essentially a national organisation, cannot be used, nor will it be used, as a pawn in the hands of foreign Powers. In so far the present world situation is concerned, the Irish Republican Army cannot recognize the right of English and American forces to utilize the industrial and agricultural resources of this country of the furtherance of their war plans. The occupation of a part of Ireland by British and American forces is in itself an act of aggression; likewise would we regard the invasion of any part of Ireland by any other foreign Power against the wishes of the Irish people. Ireland and its resources belong first and essentially to the Irish people; therefore, the occupation of any part of Ireland by any foreign Power for its own ends, whether in the guise of a protector or of a deliverer, is a usurpation of Ireland’s national integrity. Furthermore, the government of the Irish Republic being the de jure government of all Ireland, and the Irish Republican Army being its legally constituted armed force, we declare that any attempt, by whomsoever it may be made, to convert any portion of Ireland into an international cockpit, will be challenged by us. Britain occupies six of the nine counties of the historic Irish province of Ulster. She does so in defiance of the expressed wish of the Irish people, of whom she is, and always has been, the traditional enemy. The thousands of American troops now stationed at Britain’s invitation in this territory, may sincerely believe that they are preparing to fight in the cause of liberty and justice for all men. The Irish Republican Army has been and is at present preparing to fight for the same cause — In Ireland. The Irish people have no quarrel with the citizens of the United States of America, but strongly resent the unjustifiable occupation of a part of Ireland by American armed forces. It will be, undoubtedly, part of Britain’s tactics to provoke conflict between American troops and Irish guerilla forces. If in the event of the resumption of hostilities between Great Britain and the Irish Republic, the American troops are drawn into conflict with Irish soldiers, the responsibility must rest with those who presumed to use North-east Ireland as a military base without the free consent of the Irish people. Britain has partitioned Ireland into six counties and twentysix. By dividing the country politically, she has rendered it helpless economically, and indefensible militarily. That this was no accident is evidenced by the statement of Lloyd George to Lord Carson in a letter of May 29th, 1916, setting out that “we must make it clear that…. Ulster does not, whether she willit or not, merge in the rest of Ireland.” The present situation arises immediately from the execution of this policy. If, therefore, in an effort to reassert finally and for all time their country’s right to complete national sovereignty and independence, the Army of the Irish Republic should avail itself of the darkest moment in England’s history to strike, the responsibility will rest with the people of Britain, who, while professing to serve the cause of freedom for all nations, have condoned for centuries the negation of democratic principles in Ireland. Easter Sunday 1917 dawned bright and clear over the Falls Road, Belfast. In the Irish Ireland Club which stood on the site of what is now Barrack Street School, the Irish Volunteers made last minute plans for the first Easter Commemoration Parade to honour those comrades who had given their lives in the Rising of the previous Easter. The Irish Volunteers had been formed at an inaugural meeting on 25th November, 1913 in Dublin at a meeting chaired by Eoin McNeill. They were re-organised in the North after the Rising. Easter Sunday 1917 evoked bitter-sweet memories of the Glorious stand in Dublin. The Volunteers from Belfast had assembled at Coalisland on Easter Monday 1916 and had formed a junction with Volunteers from Tyrone and other areas. Now, the leaders Pearse, Connolly, Clarke, McDonagh, Plunkett, Ceannt and MacDiarmada were all dead, and other leading Republicans had also been summarily executed. Two of these leaders had associations with Belfast. James Connolly organiser of the Irish Transport and General Workers Union had lived at 420 Falls Road from 1910 to 1913. Sean MacDiarmada, a native of Leitrim, lived in Butler Street, Ardoyne, prior to 1916. He was employed as a tram driver with Belfast Corporation. Republicanism in the North was at a low ebb, and whilst the citizens of Dublin made a show of strength in their new found aspirations to Liberty by hoisting the Tricolour over the G.P.O. the ripples on the pool barely reached Belfast. Belfast was a long way from Dublin in 1917. It was in these circumstances that Sam Herron mustered his party of about 150 men in Divis Street. At 11 o’clock the order rang out and the gallant band of Irish Volunteers which included Mick Carlin, Cathal Bradley, Senior, Pat Nash and Sean Malone, started out on the march to Clonard Monastery for an Anniversary Mass, which was to be celebrated at Noon. The March proceeded peacefully enough along the Falls Road. It is recorded that the people came to gaze with something akin to astonishment at this small party of men who dares to challenge the might of the British Empire, by proclaiming openly their allegiance to their beloved Irish Republic. No women took part in this match, no bands played, no emblems were worn, no banners were carried, save at the head of this gallant company, a lightening breeze rippled the folds of the National Flag. The march is over, the Mass is said, and the men dispersed. All appears to be the same on the Falls Road, yet it is not – unseen the men on the 1917 Easter Commemoration March had down the seeds of Freedom as they went along, soon the Tree of Liberty would put forth a profusion of blossoms. Who will measure the passionate bravery which impelled the men on the 1917 march to seek to attain what seemed to many the unattainable Freedom. Who will measure the passionate bravery of those who gave their lives in the Rising, and whose blood sweetened the arid ground where it fell. Liberty might well hide her head and blush at the gifts her Irish Patriot Sons have showered on Her. This article was published in Republican News in the 1973 Easter Commemoration issue (21st April). This may be a reprint from an earlier publication (possibly Wolfe Tone Monthly). The language, such as ‘Irish Ireland’ suggests a date in the 1930s or 1940s. Some of the detail may also be inaccurate. Enough of those who mobilized in Belfast in 1916 were Protestant, like Sam Heron himself and Herbert Pim, that the idea of a march to an anniversary mass in 1917 reads more like a vision of 1917 seen through the prism of the conservatism of the 1930s. According to Roger McCorley, in a memoir, in the aftermath of the 1916 Rising and the releases from Frongoch that autumn, the Sinn Féin movement was re-organised in Belfast in early 1917 and the Sean McDermot branch of the Irish Volunteers was re-established in February/March 1917. This was followed in May by the formal re-structuring of the units in the city (including, for a time, a political commissar). As Easter was on 8th April, the 1917 Easter Rising commemoration took place between these two events. This is ‘Steele and McAteers Daring Escape from the Crumlin Road Jail’ as recorded by The Men of No Property in 1976. 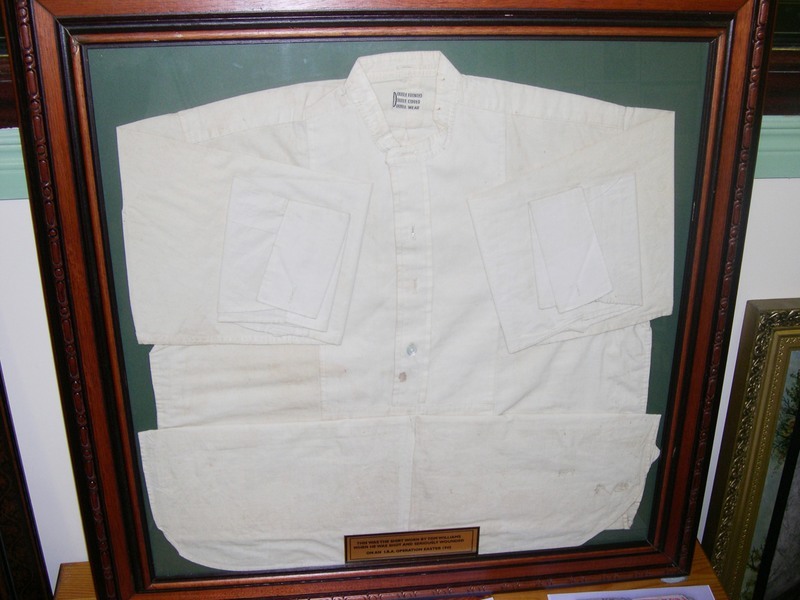 Although it is really traditional, McIlvogue claims it and Whoriskey sings it the escape happened during breakfast at Crumlin Jail Belfast on 15th January 1943. Hugh McAteer, doing 15 years for “treason”, Jimmy Steele, Pat Donnelly, the O/C of Crumlin at the time and Ned Maguire, a slater, forced their way through the roof, dropped 40 feet using sheets, climbed the 20 foot outer wall using an improvised grappling hook and made their escape, despite McAteer injuring his right leg. £3.000 a man was the reward put on their heads but no one informed and that Easter Steele and McAteer appeared to an astonished and delighted audience of film goers at The Broardway Cinema, Falls Roads when the IRA took it over for an Easter commemoration. As far as it being traditional, the lyrics may have actually been written by Jimmy Steele. Steele edited (and wrote most of) the Belfast edition of Republican News after his escape. A poem about the escape is known to have been included in the March 1943 issue (although I’ve never got my hands on a copy). He regularly included his own poetry and songs in periodicals he published. The lyrics were also printed in an undated copy of the Rushlight magazine (from some time in the late 1970s or early 1980s). In Rushlight they are laid out as three verses instead of the six that are sung in The Men of No Property’s version. They have slowed the tempo of song down in their recording, but it should be closer to that of Six Miles From Bangor to Donaghadee (as it was sung by Richard Hayward) which uses the same melody. The verses, as printed by Rushlight, fit this version better. This would also give it a more intentionally comedic and light-hearted air than the slower, more severe version recorded by The Men of No Property.